The Ford XLD418 is prone to "fuel run back" - ie fuel running back from the injection pump to the fuel tank whilst stood overnight or for long periods causing very slow starting. This can be cured by fitting a non return valve into the system between the fuel filter and the injection pump. 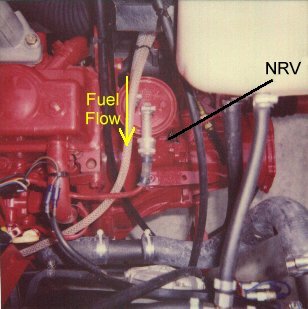 When fitting take care not to get any dirt into the system and ensure that the arrow on the valve is pointing in the direction of the fuel flow.